It’s become one of the most recognized words in the world. It’s even used as a verb. Google. It’s everywhere. You don’t search for something on the Internet—you Google it. From Google Search and Google Maps to Gmail and Google Chat, all the way over to YouTube and the Chrome web browser, it’s difficult to go through the day without using a Google product. But what about Google+ (read Google Plus)? Are you taking advantage of the second-largest social network in the world? Google Plus was established at the start of 2013 with over 500 million users. But for whatever reason, this part of the world has yet to feel the presence of this major networking giant. Nevertheless, failing to take advantage of this online network could mean losing priceless opportunities to grow your business. Why? Because Google recently launched Google My Business, making it easier for brands and local businesses to connect with consumers. It’s the best way for customers to find you. It puts your business information on Search, Maps and Google+ so you’ll be found no matter what device they’re using. Best of all, it’s free! Your customers will get the right information at the right time, whether they’re looking for your hours of operation in Search, driving directions in Maps, or your phone number to click on when using their mobile phones. They can even show some love with ratings and reviews, endorse your content, and re-share your Google+ posts. So once you set up your Google+ profile and add your info to Google My Business, you’ll be building your brand without even lifting a finger! Need more proof why you need to be on Google+? Since June 2014, there were 343 million active accounts in Google+. Further, 68 percent of online searches are done on Google, and having a presence on Google+ can actually help your company rank higher in their search results! This is a market you can’t ignore in terms of visibility. The results page on Google Search has become a game-changer for brands’ online presence and visibility. Google+ is a powerful SEO force and should be one of your main social media marketing tools. In addition to typical business information, images, website and social media details, and maps, anyone can view and follow your brand on Google+ directly from Google search results. That means the search page is prime real estate to introduce your brand. Plus, having a local listing helps to give you first-page visibility. And along with your other marketing efforts, you’ll have a better chance of appearing more times via natural/organic and paid advertising with Google AdWords. 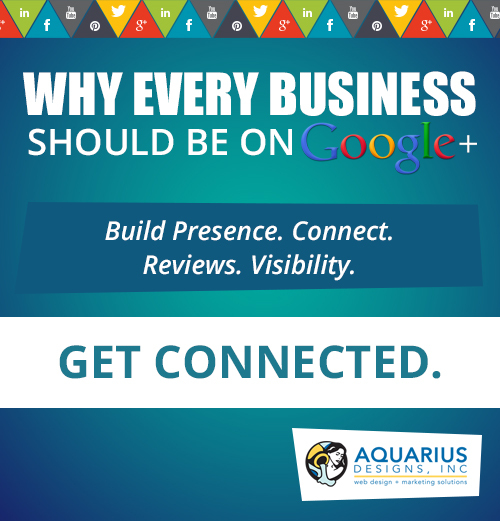 Google+ is a great way to stay connected and share with customers, clients and colleagues. Once you’re in the Google+ world, you have access to tons of resources in one single place to connect in any medium you like: Hangouts, Communities, YouTube, Google Search, Google Maps and more. Each optimizes your marketing strategy, taking your brand even further. But first you’ll want to create your community by adding people to your “Circles,” a central feature of Google+. Just do a quick search to find whomever you’d like to connect with. If they have a profile page, you can add them to your Circles to keep in touch. Then you can share content, get updates from others, engage in Communities or create Hangouts for real-time communication. And the more people and businesses you follow, the higher your search result rankings. Did you know 60 percent of consumers consider ratings and reviews important when researching businesses? What’s more, nearly 70 percent of US Internet users compare prices or read reviews before visiting a brick-and-mortar store. Online reviews play a significant role with consumers looking for businesses and purchasing products. The Internet has made it possible to find this information quickly, and mobile devices like smartphones have made it easier to find on the go. Bottom line—reviews matter. According to Google, “business listings that had at least 3+ star reviews took 41 out of 47 clicks.” They also found that “the number of reviews counts, too—29 of those 47 clicks went to listings that had at least four reviews.” What does that mean for your business? The amount of reviews has big value. But keep in mind that you should focus on getting quality reviews from customers. Quantity will come naturally over time as your business continues to provide great service and products. Seek out good reviews from your customers and be sure to share them everywhere you can. Google+ was built from the ground-up as a content-sharing platform. It pretty much takes the good features of Facebook and Twitter and makes them better. Sharing content is one of the most important parts of Google+, helping you to build authority, expose you to new audiences and increasing web traffic. But you must share wisely. Many believe that setting the post to “public,” gives them maximum exposure, but adding your Circles and select individuals to your share settings is much more effective. It this triggers a notification to them that you’ve shared a post directly with them. Used smartly, these notifications can have a big impact on the amount of activity on a post. Chances are your customers are already on Google+. Once you are too, you can take your regular activity on social media to a whole new level, boosting your search engine ranking and your brand recognition. If you’re not already networking on Google+, it’s time to start using one of the most powerful online tools.